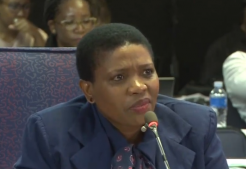 Suspended National Prosecuting Authority (NPA) Deputy NDPP, Advocate Nomgcobo Jiba, has described the Mokgoro Enquiry as a liberating opportunity to give her side of the story. The enquiry is investigating her fitness to hold office. Jiba is charged with misconduct and mishandling high profile cases. If found guilty, she could lose her job. Taking the stand for the first time at the enquiry, Advocate Jiba started with a prepared speech. She says, for many years, she was unfairly vilified for doing her job and welcomes the opportunity to be judged by a fair panel. Jiba has described the NPA as bigger than anyone. However, she says she was disappointed to hear testimonies from current to former colleagues who described her as unqualified for the job of Deputy NDPP. Jiba told the enquiry she has a total of 27 years of experience within in the NPA. Reflecting on her difficult times within the NPA, Advocate Jiba says she was deeply hurt when she faced perjury charges. This after she authorised racketeering charges against former KZN Hawks boss Johan Booysens. The post Mokgoro Enquiry a liberating platform: Jiba appeared first on SABC News – Breaking news, special reports, world, business, sport coverage of all South African current events. Africa's news leader..